LARU15 Human Era – Nordic Environmental Art Exhibition is an international art project that takes place at an environmentally protected shoreline area in the district of Lauttasaari in Helsinki from 30.8.–4.10.2015. It is organised by LARU ART, an Helsinki-based artist-driven non-profit organisation. Operational since 2005, LARU ART produces international environmental art events in which media art and performance art have both featured prominently. To celebrate its first decade in 2015, LARU ART organises a three-day Nordic festival, LARU15. The opening ceremony of the festival is on Saturday 29 August. The festival programme includes a panel discussion on environment art, an evening of performance art, and an evening of video art. The anniversary year started with Landscape – Metropolis – Finland, Ireland, Berlin – exhibition, which was organized in collaboration with other organizations. PARTICIPATING ARTISTS Riikka Aresalo, Annette Arlander, Martin Binder, Sahar Burhan, Benedicte Clementsen, Juli Foos, Ingrid Furre, Saad Hajo, Lise Haurum Chirstensen, Ipe Heinonen, Heli Hietala, Sofia Hultin, Ingela Ihrman, Pauliina Jokela, Sanna Karlsson-Sutisna & Company (Sibiry Konate, Tiina Mankki, Cheick Cissokho, Issiaka Dembele, Lassina Ouattara), Anna Kinbom, Kaisu Koivisto, Anna-Lea Kopperi, Juha Sven Korhonen, Kristiina Ljokkoi, Oakalo Group (Suvi Ermilä, Pia Grüter, Riikka Keränen, Emilio Zamudio Murillo, Pia Lindman, Niko Nurmi), Leena Mäki-Patola, Eeva-Liisa Puhakka, Tomas de Rita, Otto Santala, Aino el Solh and Ósk Wilhjálmsdóttir. LARU15 opening ceremony on Sat 29.8. at 14.00–20:30. Guided tours and performances by Sanna Karlsson-Sutisna & Company, Sofia Hultin, Lise Haurum Christensen, Anna Kinbom, and Annette Arlander. An evening of video art, satire and closing ceremony on Mon 31.8. from 18.00–22.00 at MUU Gallery, Lönnrotinkatu 33, Helsinki. Busses 21V, 65A, 66A. The google maps link: https://www.google.fi/maps/place/Särkiniemi,+00210+Helsinki/@60.1478572,24.8770907,15z/data=!4m2!3m1!1s0x46920af690160d5f:0xb7f2316a8d38c54c. There are LARU ART signs that point the way to the shoreline exhibition area. Look for signs at the last bus stop on Itälahdenkatu and at the end of Särkiniementie road. Information tags are mounted on trees near the artworks. The exhibition is open around the clock. LARU ART Association presents LARU14 RITE NOW – NYT RIITTI, the 9th annual event of the International Environmental Art exhibition. The opening ceremony is on Saturday August 30th from 14:00 to 17:00 on Särkiniemi shore in Lauttasaari, Helsinki. The exhibition, from August 31st to October 5th 2014, features artists and authors from China, Cuba, Finland, Germany, Italy, Poland and Ukraine. They are joined in the common aim to offer surprising contents to the question of What ritual is or has been there, and what gets you bored or demands immediate actions? PARTICIPATING ARTISTS Katarzyna Balcerowska, Suvi Haapala, Steffen Halme, Ipe Heinonen, Taika Ilola, Miia Kallio & Otto Santala, Anna- Lea Kopperi, Erika De Martino, Anu Miettinen, Anu Nirkko, Alberto Oviedo Stuart, Eeva-Liisa Puhakka, Petro Veretilnyk, Willem Wilhelmus and Wensi Zhai. CONCEPT LARU14 exhibition challenges the artists once again. Rite Now – means both ‘get bored’ or ‘make the rituals visible’. What kind of rituals has been there or what kind of rituals is there? What does it mean to ‘get bored’? What about getting bored with old or present rituals? What needs action right now? The artists create new interpretations of the theme from various points of view. LARU14 exhibition opening on Saturday August 30th from 14:00 to 17:00. Performance art by Ipe Heinonen, Taika Ilola and Willem Wilhelmus. Dream Interviews by Anu Miettinen who welcomes participation. Guided tours and performances start from Särkiniemi sandy beach, on Sundays September 14th and October 5th at 14:00. Press conference will be held on request. TRANSPORT AND SIGNAGE Busses 21V, 65A, 66A. Helsinki map page 19 4 – 5 BC. There are LARU ART signs in the shore area. Look for the signs at the last bus stop on Itämerenkatu and at the end of Särkiniementie road. Information tags are mounted on trees near the artworks. The exhibition is open around the clock. BACKGROUND LARU ART is a Helsinki-based non-profit association whose purpose is to promote environmental awareness and creation of art, and convergence of artists. Association implements these goals by organising various events. LARU is an international environmental art event held annually in Lauttasaari, Helsinki. Lauttasaari was selected as the primary venue for the event because the area combines dense residential habitation with shore areas in recreational use. As part of the surrounding nature, the shores around Helsinki are unique. They have recently been in the spotlight of public debate because of alternative land use plans. LARU collaborates with Save Vartiosaari Art Project since 2012. Another key theme of the event is interaction and mutual cooperation of artists of different ages in order to find creative approaches to sustainable development in life, nature protection and biodiversity conservation, as well as bringing art into everyday life of people along the jogging path or the way to the grocery store. Expanding each year, LARU workshops, media art events and different kinds of performances support a new dimension of formation of ecological relationships. The exhibition, from September 1st to October 6th 2013, features artists and authors from China, Cuba, Finland, Germany, India, Italy, the Netherlands, and Sweden, joint by the common aim to offer surprising contents to the question How Do You Experience Natural Intelligence? PARTICIPANT ARTISTS: Shachindra Dass, Suvi Haapala, Steffen Halme, Ismo Heinonen, Heli Hietala, Sofia Hultin, Miia Kallio, Jukka-Pekka Kervinen, Erika De Martino, Anu Miettinen, Cemile Nisametdin, Elvira Nuri, Egle Oddo, Otto Santala, Selja Raudas, Alberto Oviedo Stuart, Jonne Pitkänen, Eeva-Liisa Puhakka, Willem Wilhelmus and Wensi Zhai. CONCEPT: This edition offers to the artists the challenging commission to define with their works not only what is their individual approach to Natural Intelligence, but also to recreate somehow the experience of it. Natural intelligence (NI) is the opposite of artificial intelligence: it is all the systems of control present in biology. Normally when we think of NI we think about how animal or human brains function, but there is more to natural intelligence than neuroscience. Nature also demonstrates non-neural control in plants and all kinds of living individuals. Our behaviour co-evolves with our bodies, with the changing environment, in response to our relations to individuals of other species, and to multiple feed-back dynamics. Understanding natural intelligence requires understanding all of these influences on behaviour and behavioural interactions. The knowledge related to a broader understanding of these phenomena might be the key to a smarter, cleaner and more ethical progress in human society. LaruArt@Suvilahti in The Night of the Arts on August 22 at 19:00-22:00 at Magito, Kaasutehtaankatu 1, bulding 7, Helsinki. Performances, video screenings, music, dj in collaboration with Magito and Sula. LARU13 exhibition opening on Saturday August 31 from 14:00 to 17:00. Performance art by Willem Wilhelmus, Selja Raudas and Ipe Heinonen. Guided tours and performances starts from Särkiniemi sandy beach, on Sundays September 8 and October 6 at 14:00. LARU ART is a Helsinki-based non-profit association whose purpose is to promote environmental awareness and creation of art, co-operation of various artists’ associations and convergence of artists. Association implements these goals by organising various events. LARU is an international environmental art event held annually in Lauttasaari, Helsinki. Lauttasaari was selected as the primary venue for the event because the area combines dense residential habitation with shore areas in recreational use. As part of the surrounding nature, the shores around Helsinki are unique. They have recently been in the spotlight of public debate because of alternative land use plans. Rudus, Kulturfonden Sverige Finland, Längmanska Kulturfonden, Helge Ax:son Johssons Stifelse. Busses 21V, 65A, 66A. Helsinki map page 19 4-5 BC. There are LARU ART signs in the shore area. Look for the signs at the last bus stop on Itämerenkatu and at the end of Särkiniementie road. Information tags are mounted on trees near the artworks. The exhibition is open around the clock. LARU12 RESIST environmental art exhibition during 01.09 – 7.10.2012 and CROSSINGperformance on 23.08.2012 in Helsinki and 25.08.2012 in Vantaa. This year’s theme focuses on specific conflicts and choices: Resist during the economical crisis; Resist and oppose to anti- democratic laws; Resist together with the environment to avoid the impoverishment of resources and bio-diversity; stop Resisting natural emotions and feelings. In 2012 LARU increased its emphasis on performance, art and cross-linking of science. LARU12 is the seventh environmental art exhibition organised by LARU and features a multi-cultural group of multi-disciplinary artists and authors from China, Cuba, Finland, Germany, India, Italy, Scotland, Sweden, Tatarstan and Russia. The artists at the core group are Steffen Halme, Ismo Heinonen, Anu Miettinen, Egle Oddo and Timo Tuhkanen. Invited artists are Minna Alaluusua, Suvadeep Das, Shachindra Dass, Zhanna Glyadelkina, David Graham, Suvi Haapala, Heli Hietala, Sofia Hultin, Jukka-Pekka Kervinen, Anna-Lea Kopperi, Ria Piritta Mette, Eeva Meltio, Cemile Nisametdin, Elvira Nuri, Alberto Oviedo Stuart, Eeva-Liisa Puhakka, Mika Rekola, Raita Virkkunen and Wensi Zhai. 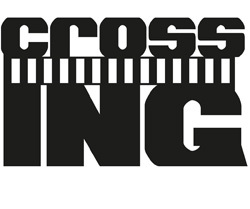 CROSSING performance by the LARU Performance Group during The Night of the Arts on 23.08 at 15.00 – 17.00 at the roundabout of Runeberginkatu and Salomoninkatu, Helsinki. LARU12 RESIST environmental art exhibition event opening on 01.09 at 16.00 – 20.00 located on Särkiniemi shore in Lauttasaari. The exhibition opening will feature performance art and guided tours. Press conference will be held on Tuesday 04.09 at 11.00 – 13.00 and further on upon request. LARU12 guided tours are on Sundays 16.09 and 07.10 at 14.00. The tour starts from Särkiniemi sandy beach. In addition to the mentioned guided tours, you can also reserve a separate paid group visit to the exhibition. Helsingin kulttuurikeskus, Rudus, Voima, Kulturfonden i Sverige och Finland (Sofia Hultin), Helge Ax:son Johnsons stiftelse (Sofia Hultin). Art Association LARU ART organizes LARU 11 BREAK, which is an environmental art exhibition event staged by an international group of artists from 3.9.-2.10. 2011 in Helsinki by the Särkiniemi beach. 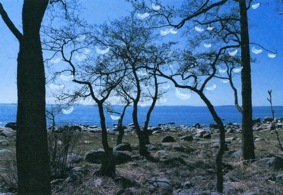 An opening day events are on Saturday 3.9.2011 at 16.00 – 20.00 hrs by Särkiniemi beach. A meeting with the press will be held on Tuesday 6.9.2011 at 11.00 – 13.00 hrs. The programme during the opening is: a speech, performances and the tours with artists presenting their works to the public. Heli Hietala, Sofia Hultin, Raita Virkkunen and Willem Wilhelmus will do performances during the tour. The artists of the core group are Anu Miettinen, Egle Oddo, Suvi Haapala and Ismo Heinonen. Invited artists are: Minna Alaluusua, Shachindra Dass, Zhanna Glyadelkina, David Graham, Steffen Halme, Heli Hietala, Sofia Hultin, Sirpa Jokinen & Pekka Nevalainen, Anna-Lea Kopperi, Ria Piritta Mette, Eeva Meltio, Eeva-Liisa Puhakka, Anu Sallinen, Reetta Sironen, Hans-Peter Schütt, Alberto Oviedo Stuart ja Raita Virkkunen ja Willem Wilhelmus. This year the artists have been working on the concept of “BREAK”. Exhibition theme “BREAK” is a word that can be applied and interpreted in many interesting ways for example “Coffee Break” or “Break the Silence”. Although the participating artists speak a variety of languages e.g. Finnish, Swedish, Russian, Estonian, Italian, Spanish, German, French etc. the theme “BREAK” was chosen as common communication language is English. Communication medium is not only a language but also gestures and tone of voice therefore major part of art works without any language, and easily communicates even within differences in languages. This is the sixth environmental art exhibition organized by the artist group. A printed card is available that serves as a guide to the exhibition and the works of art. There can be also found standing signs pointing to the exhibition sites. PROGRAM LARU 11 – Opening ceremony 3.9.2010 at 16.00-20.00. Exhibition opening will feature performance art and guided tour of the exhibition. Heli Hietala, Sofia Hultin, Raita Virkkunen and Willem Wilhelmus will have performances during the tour. LARU 11 – Guided tour of the exhibition on Sunday 18.09.2011 and 2.10.2011 at 15.00. The tour will start from Särkiniemi´s sandy beach. The LARU ART association was registered formally in the year 2007. LARU is an international environmental art event held annually in Lauttasaari, Helsinki. Lauttasaari was selected as the primary venue for the event because the area combines dense residential habitation with shore areas in recreational use. As part of the surrounding nature, the shores around Helsinki are unique. They have recently been in the spotlight of public debate because of alternative land use plans. Other central themes of the LARU art festival are site-specificity, the proximity of the sea, and using art to produce value added to land areas. One aim of the event is also to develop interaction and cooperation between artists through workshops. Apart from wanting to draw attention to the sea, LARU also wants to highlight the constructed environment in Lauttasaari and to pose questions about the relationship of constructed environment to nature. The first LARU event was organised in 2006. The participants make artworks both for natural settings and for the constructed environment, both in Lauttasaari and elsewhere. LARU wants to bring art into the everyday life of people, along the jogging path or the way to the grocery store. Most of the materials used in the works of art are either recycled or collected from nature. Art Association LARU ART organizes LARU 10, which is an environmental art exhibition event staged by an international group of artists from 29.08.-2.10. 2010 in Helsinki by the Särkiniemi beach. A meeting with the press will be held on Saturday 28.08 at 15:00-17:00 hrs. and opening day events are on Saturday 28.08 at 17:00-21:00 hrs. by Särkiniemi beach. The programme during the opening is: a speech, a performance and the artists will be present to discuss their works with the public. The artists of the core group are Shachindra Dass, Anastasia Eliseeva, Anu Miettinen, Egle Oddo and Suvi Haapala. Invited artists are: Zhanna Glyadelkina, Steffen Halme, Heli Hietala, Alberto Oviedo Stuart, Raita Virkkunen, Johanna Paalanen, Reetta Sironen, Eeva-Liisa Puhakka, Anna-Lea Kopperi, Kirsi Kuronen, Sirpa Jokinen, Pekka Nevalainen, Sofia Hultin, Ismo Heinonen, Anu Sallinen. This year the artists will work on the concept “Out Of The House”. The exhibition displays a collective experience of daily lifestyles. Human houses have objects developed and designed for centuries for comfort and utility. These objects however belong inside the house. The OOTH exhibition intends to bring these objects, necessary for daily living, out of the house. Everything that will be presented in this exhibition is something that should in principle be inside the house but the artists translate its usage and necessity to bring it outside. A printed card is available that serves as a guide to the exhibition and the works of art. There are also signs pointing to the exhibition sites. On the opening day, 28 August 2010, there will be performances and the artists will be present to discuss their works with the public. 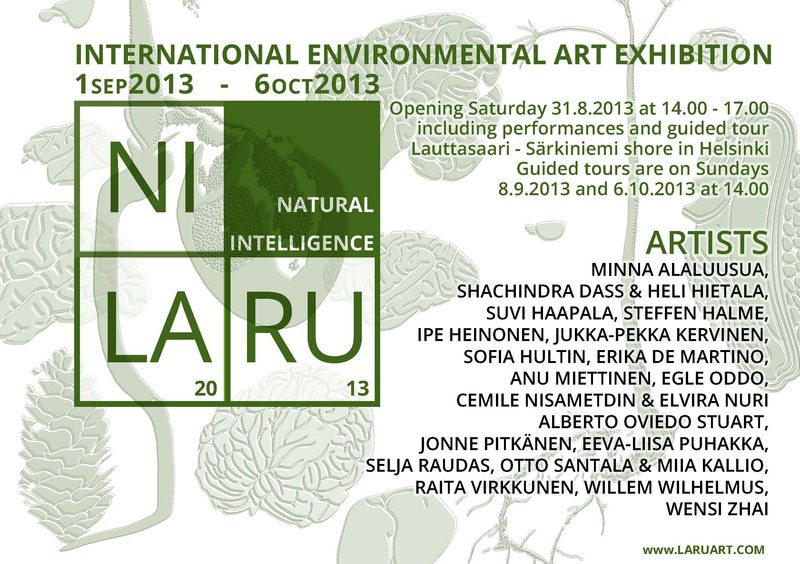 LARU 10 is the fifth environmental art exhibition and happening held by the group in Lauttasaari. PROGRAM LARU 10 – Opening ceremony 28.08.2010. (17:00) LARU 10 – Opening ceremony. (17:30) Performance by Raita Virkkunen – Mopping the Terrain. (18:00) Exhibition tour. (19:00) Performance by Sofia Hultin – The Most Beautiful Feathers. (20:00) Performance by Anna-Lea Kopperi – Rower – The Last Voyage. The LARU ART association was registered formally in the year 2007. LARU is an international environmental art event held annually in Lauttasaari, Helsinki. Lauttasaari was selected as the primary venue for the event because the area combines dense residential habitation with shore areas in recreational use. As part of the surrounding nature, the shores around Helsinki are unique. They have recently been in the spotlight of public debate because of alternative land use plans. Other central themes of the LARU art festival are site-specificity, the proximity of the sea, and using art to produce value added to land areas. One aim of the event is also to develop interaction and cooperation between artists through workshops. Apart from wanting to draw attention to the sea, LARU also wants to highlight the constructed environment in Lauttasaari and to pose questions about the relationship of constructed environment to nature. The first LARU event was organized in 2006. The participants make artworks both for natural settings and for the constructed environment, both in Lauttasaari and elsewhere. LARU wants to bring art into the everyday life of people, along the jogging path or the way to the grocery store. Most of the materials used in the works of art are either recycled or collected from nature. Art Association LARU ART organizes LARU 09, which is an environmental art exhibition event staged by an international group of artists from 29.08.-27.09. 2009 in Helsinki in a shopping center in Lauttasaari, by the shore at Lauttasaarentie 24 and Särkiniemi beach and the park area between those. A meeting with the press will be held on Friday 28.08 at 12-14 and opening day events are on Saturday 29.08 at 15-18 by Särkiniemi beach. The programme during the opening is: a speech, a performance and the artists will be present to discuss their works with the public. The artists of the core group are Shachindra Dass, Anastasia Eliseeva, Anu Miettinen and Egle Oddo. Invited artists: Zhanna Glyadelkina, Suvi Haapala, Steffen Halme, Heli Hietala, Alberto Oviedo Stuart, and Patrick Timm. This year the artists will work on the concept of processing time, including the use of narrative structures, i.e. the concept of a story and the form used to tell the story. But not only. A story is an action in time, nature is a perpetual process that includes circularity, non-linear patterns, diachronic and yet a story needs an external observer to put a limitation to the infinite possibilities. The interaction between the limits of the observer and the unlimited resources of nature generates stories. For the duration of the exhibition Lauttasaari will become a small, limited cosmos where the stories produced by the artists will “act”. A printed card is available that serves as a guide to the exhibition and the works of art. There are also signs pointing to the exhibition sites. On the opening day, 29 August 2009, there will be performances and the artists will be present to discuss their works with the public. LARU 09 is the fourth environmental art exhibition and happening held by the group in Lauttasaari. The LARU ART association was registered formally 2 years ago. LARU is an international environmental art event held annually in Lauttasaari, Helsinki. Lauttasaari was selected as the primary venue for the event because the area combines dense residential habitation with shore areas in recreational use. As part of the surrounding nature, the shores around Helsinki are unique. They have recently been in the spotlight of public debate because of alternative land use plans. Other central themes of the LARU art festival are site-specificity, the proximity of the sea, and using art to produce value added to land areas. One aim of the event is also to develop interaction and cooperation between artists through workshops. Apart from wanting to draw attention to the sea, LARU also wants to highlight the constructed environment in Lauttasaari and to pose questions about the relationship of constructed environment to nature. The first LARU event was organised in 2006. The participants make artworks both for natural settings and for the constructed environment, both in Lauttasaari and elsewhere. LARU wants to bring art into the everyday life of people, along the jogging path or the way to the grocery store. Most of the materials used in the works of art are either recycled or collected from nature. Art Association LARU ART organizes LARU 08, which is an environmental art exhibition event staged by an international group of artists from 6.9.-5.10. 2008 in Helsinki, in a shopping center in Lauttasaari, by the shore at Lauttasaarentie 24 and Särkiniemi beach and the park area between those. A meeting with the press will be held on Friday 5.9. at 12-14 p.m. and opening day events are on Saturday 6.9 at 15-18 p.m by Särkiniemi beach. The programme during the opening is: a speech, a performance and the artists will be present to discuss their works with the public. Patrick Timms performances will be staged 6.9 and 8-11 September at 11-17, at the shopping center and Särkiniemi beach. The artists of the core group are Schacindra Dass, Nastia Eliseeva, Anu Miettinen, Egle Oddo and Sirkka Tapio. Invited artists: Anna Myga Kasten, Päivi Marika Takala, Marko Timlin and Patrick Timm. The theme of this year’s LARU ART event is “Piilosta / Hide and Seek”, a concept that implies a range of meanings from concealment and secrecy to discovery and revelation. The theme originates from the concept of the permanent sculpture, NUPPU, designed collectively by the LARU team. How do we see the present moment when we compare it to our ideas of the future? What aspects of the present would we like to preserve for the future? What is visible in this moment, what is invisible? A printed card is available that serves as a guide to the exhibition and the works of art. There are also signs pointing to the exhibition sites. On the opening day, 6 September 2008, there will be performances and the artists will be present to discuss their works with the public. More performances will be staged 8–11 September 2008. LARU 08 is the third environmental art exhibition and happening held by the group in Lauttasaari. This year the team also presented a performance, La Sal, in cooperation with the production organisation of the Night of the Arts festival in Helsinki. The LARU team will also organise a media art night with the MUU Artists’ Association. The LARU ART association was registered formally last year. LARU is an international environmental art event held annually in Lauttasaari, Helsinki. Lauttasaari was selected as the primary venue for the event because the area combines dense residential habitation with shore areas in recreational use. As part of the surrounding nature, the shores around Helsinki are unique. They have recently been in the spotlight of public debate because of alternative land use plans. Other central themes of the LARU art festival are site-specificity, the proximity of the sea, and using art to produce value added to land areas. One aim of the event is also to develop interaction and cooperation between artists through workshops. Apart from wanting to draw attention to the sea, LARU also wants to highlight the constructed environment in Lauttasaari and to pose questions about the relationship of constructed environment to nature. The first LARU event was organised in 2006. The participants make artworks both for natural settings and for the constructed environment, both in Lauttasaari and elsewhere. LARU wants to bring art into the everyday life of people, along the jogging path or the way to the grocery store. Most of the materials used in the works of art are either recycled or collected from nature. The event has several cooperation partners. Each year LARU expands its scope through new types of events. This year LARU PERFORMANCE GROUP gave a performance entitled LA SAL during the Night of the Arts festival, with participation by the audience. The performance was sponsored by Meira Oy and the production organisation of the Night of the Arts festival. The first Media Art night will be held in the premises of the MUU Artists’ Association later this autumn. TRANSPORT AND SIGNAGE: Busses 21V, 65A, 66A. Helsinki map page 19 4-5 BC. There are orange LARU ART signs in the shore area. Look for the signs at the last bus stop on Itämerenkatu and at the end of Särkiniementie road. Information tags are mounted on trees near the artworks. The exhibition is open around the clock. Other LARU happenings: Mon 29.9.08 18-21 p.m. Media Art evening Muu ry, Lönnrotinkatu 33. Free entrance. Planning of NUPPU-sculputure (Eliseeva, Miettinen, Oddo) supported byMetsämiesten Foundation. The exhibition has been supported by City of Helsinki Cultural Office, Recycling Center, K-Rauta Ruoholahti Corporation, Meira CO, Emmaus Helsinki ry, Lauttasaari Shopping Center, Taiteiden yön tuotanto, Muu ry, Antti Katajisto, Pekka Leppänen, Simo Suhonen, Mikko Kuittu, Ossi Kajas & Magito, Timo. LARU 06 – environmental art exhibition and community art event in Särkiniemi, Lauttasaari, from 2 September to 1 October 2006. Phone directory map 19 5 BC. Buses 65A, 66A and 21V. Opening and community art event on Lauttasaari Day on 2 September 1pm–4pm. Performance at 1pm. The exhibition is open around the clock. Signs showing the way to the venue start at the last bus stop of the bus route at the end of Itälahdenkatu street. Exhibition artists: Anastasia Eliseeva, Krista Kortelainen, Kaisu Lundelin, Annukka Majamäki, Pirjo Malkki, Anu Miettinen, Egle Oddo. On 2 September, Lauttasaari Day, the audience can participate in making community art. The artists will also be present to discuss their works with the public. Signs showing the way to the exhibition start from the last stop of the bus route at the end of Itälahdenkatu street. The works are all in a small area and easy to find. The themes of LARU 06 are the sea, the shore and the meeting of the two on the shoreline. Other important aspects of the exhibition are co-operation with local residents, site-specificity and using art to produce added value to natural areas. The exhibition organisers work in co-operation with the local residents’ association, Lauttasaari Society. The works of art are made of natural and recycled materials as far as possible. LARU 06 is the first environmental art exhibition and happening held by the group in Lauttasaari. It is intended as a regular event to be organised every autumn. Lauttasaari is an excellent place to have an exhibition of environmental art as it combines densely-built residential areas with large recreational shoreline areas. Moreover, there is hardly any (public) art in Lauttasaari. Compared to many other cities, the shores in Helsinki and the natural areas associated with them are exceptional and unique. The shores in the various parts of the city have recently been in the centre of a public debate because of alternative land-use plans. LARU 06 therefore has several aims: First of all, to draw attention to the existence and fate of shorelines in Helsinki. Secondly, to provide an opportunity to experience art along the seaside also for people who do not regularly frequent art galleries and museums. Thirdly, to offer people an opportunity to participate in making community art. The exhibition is sponsored by the City of Helsinki Cultural Office, Helsinki Windsurfing Club, Kierrätyskeskus, Lauttasaari-seura, Picaset Oy, Tehtaankadun Emmaus.